Sienna Resources (SIE—TSX.v) (A1XCQ0 –FSE) (SNNAF—OTCBB) is pleased to announce the commencement of drilling on its Slättberg Cobalt-Nickel-Copper Project in Sweden (the “Project”) is now underway. This maiden drill program will consist of 5-7 prioritized drill holes of 125-200 meters in length. The first holes will target a zone of massive sulfide mineralization intercepted in historic drilling (1970-era) near the Helenegruvan Mine. The first hole will target a shallow zone of mineralization intersected in previous drill holes, but will be assayed for a wider range of elements than the historic drill holes, including gold and PGE. Other holes will test down dip extensions of the mineralization that were not tested by the shallow historic drill holes. The second group of drill targets will focus on a strong magnetic anomaly identified by 2018 ground magnetic surveys in the vicinity of the Myrgruvans Mine. This robust magnetic anomaly is positioned to the east of the mine workings, and has not been tested by historic drilling. Other drill holes will target the western end of the trend of mine workings, where the most voluminous mining took place, and mineralization remains open at depth. Earlier this month, Sienna significantly increased its acreage on its Slättberg Cobalt-Nickel-Copper Project. The Slättberg Cobalt-Nickel-Copper Project now consists of 3 exploration licenses covering 12,733 acres and at least 16 historic mines, with 1 being the historic Mårtanberg copper mine, which was operated in the late 1700’s and early 1800’s. The Mårtanberg field is known for its copper-rich skarn-style mineralization. The underground workings extended to depths of 80-100 m, and little to no modern exploration has been conducted in the area. We plan to bring modern techniques and views to this added acreage. On January 30, 2018 we announced that initial results have been received from the ongoing magnetic survey work on the Slättberg Cobalt-Nickel-Copper Project in Sweden. High resolution magnetic surveys in the area of historic nickel-copper-cobalt mines have defined multiple strong magnetic responses along the trends of mineralization. These areas of strong magnetic response are interpreted to represent steeply plunging bodies of massive sulfide mineralization that is rich in pyrrhotite. The magnetic data appears to confirm additional continuity of drill defined zones of mineralization known from the historic drilling. Along with the historic drill data, this new magnetic data is being used to define multiple high priority drill targets for the upcoming drill program. 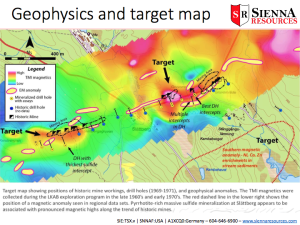 Slättberg’s massive sulfide mineralization is known to be strongly magnetic, owing to its high concentrations of pyrrhotite, a magnetic ferrous sulfide mineral associated with the Co-Ni-Cu mineralization. The new magnetic data is being used to potentially generate additional high priority drill targets on the project. The Slättberg Cobalt-Nickel-Copper Project now consists of three adjacent exploration permits comprising approximately 12,733 contiguous acres. Slättberg is located 25 kilometers northwest of Falun, Sweden. Slättberg is a historic mining camp hosting cobalt-nickel-copper rich massive sulfide mineralization that occurs within a two kilometer belt of historic nickel-copper mines. The Project contains drill defined massive sulfide mineralization that extends to ~100 meters in depth, and remains open for expansion at depth and along strike. The Project is accessible year round, with nearby rail, power and 5 smelters in the Nordic region. At least 16 historic mines are located on the property, with historic operations dating back to the late 1800’s. Mineralization at Slättberg is hosted by 1.8-1.9 Ga (Svecofennian) supracrustal rocks (metavolcanics and metasediments) located along the southwestern flank of a large gabbroic intrusive complex. The historic mines are positioned along an east-west trend of massive sulfide occurrences developed in and around a similarly oriented body of “leptite”. This is a local term used to describe rhyolitic/felsic tuffaceous rocks commonly associated with sulfide mineralization in Bergslagen. Mafic and ultramafic rocks also occur in and around the mine workings. Sweden is at the forefront of an exploration and development boom in the mining industry. The country’s favorable business environment includes a low corporate income tax rate, a proactive geological survey, and broad public support for export-led resource extraction. Sweden has a long history of mining, and is host to some of Europe’s largest active mines. The technical contents of this release were approved by Greg Thomson, PGeo, a qualified person as defined by National Instrument 43-101. Sienna Resources Inc. is focused on exploring for and developing high-grade energy metal deposits in politically stable, environmentally responsible and ethical mining jurisdiction, essential for the rapidly growing rechargeable battery and renewable energy sectors.